Well, in the past the combination rule was relevant no matter what. But today, the things have dramatically change and so the style combination. The guidance rules of our grandmothers and mothers are long gone. They are no more in tune with the modern vibes of this generation. A natural thing after all. Nowadays, it seems that the superstars decisions are the ones who are likely to dictate de fashion tendencies. As an example we have Angelina Jolie. At the Golden Globe Award she decided to combine her bag with her lipstick colour. She than was followed by other stars from showbiz. However, when combining the shoes with your bag there’s a simple rule to be fallowed. The colours need to suit each other. Anyway you should know there’s a big difference between contrasting combinations and colour that just not match. And as an idea, the colour wheel might help when you need to contrast the colours. This concept is based on complementary colours. To understand it easier, in the wheel the opposite colour is complementary. Red and green or orange with blue, for example.. The three colour rule also applies, because mixing to many colours can be misleading. Let’s take this as an example. A blue bag with yellow shoes might look like a great idea at the beginning. Anyway, this combination is actually confusing, if take a look closer. Still, you can solve the problem if you put on a neutral colour. 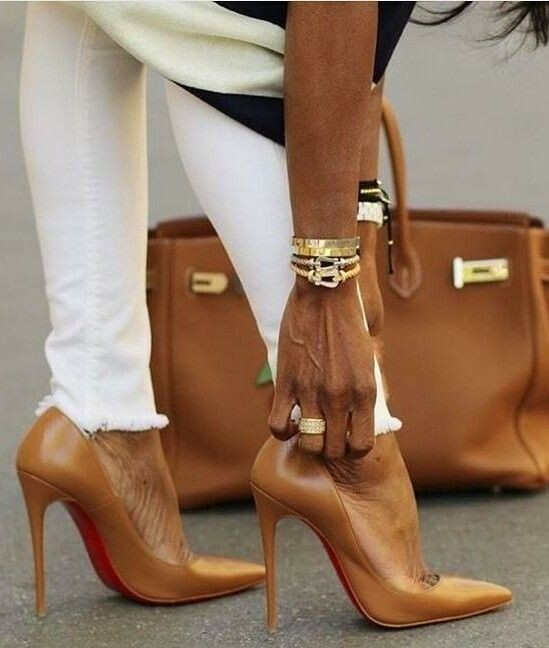 Bags and shoes should not be combined only in colours, but also in style. A pair of jeans and a T-shirt is a more casual combination. When it comes to elegance, things are changing, based on the event. As an advice, not be shy and scared. The right combination will make you shine anywhere. In the video bellow you take a look at 2018 Fall and 2019 Winter handbags trend!